This plant is indeed an orchid. Unfortunately, I don't recognize the particular type; it's growing in the ground as a terrestrial orchid, right? I do not know of any terrestrial species that look like that, so I'm not sure what it is! Does anyone else recognize it? Wow! It doesn't look like any of the native orchids of Oregon, so maybe a neighbor planted it there? A Bletilla, the thing is I don't see the leaves very well in the picture. Look for Bletilla images and see if it looks like your plant. I'm new at this, so do not trust me 100%. 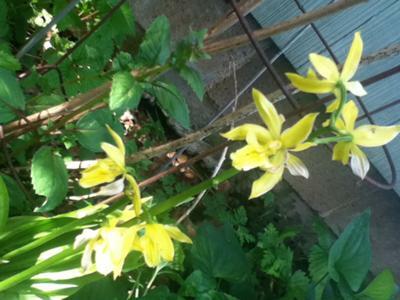 I believe your yellow terrestrial orchid is originally from Japan -- Calanthe sieboldii. We're only missing your confirmation if you google the name he gave you (Calanthe sieboldii) and go to the images tab you can see pictures with the plant included, if the plant looks like yours then you probably got it! If the plant looks different than yours we need to keep looking for the name. THe description of the plant in your first post made me think of a Bletilla, but a closer look of the flowers and the likeliness of the other candidate given to you discourage me on the idea.